Costessey is famously pronounced Cossey, and is spelt that way in some older documents. Despite the traffic, old Costessey still has something of the character of a village. 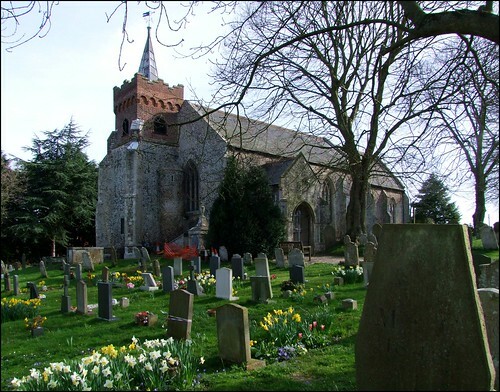 The parish also contains a vast housing estate, a suburb of Norwich down towards the Dereham Road, but St Edmund is away from all that, and its narrow, pretty graveyard is a peaceful spot. There are a number of interesting stones, including an unusual 19th century tombchest decorated with floral medallions which I think may be constructed from the locally produced cosseyware, and an excellent late 18th century classical structure surmounted by an urn which is a memorial to members of the Wilkin family. Unfortunately, the Wilkin memorial is currently surrounded by the flourescent orange netting beloved of the Health and Safety fascists, and a number of other headstones have bright yellow warning triangles on them, an obscenity in an English churchyard. The unfinished tower is surmounted by an elegant red brick bell stage which looks as if it might be on a visit from southern Europe, and a lead covered spirelet, which replaced a wooden spire in 1930. The tower is set against the northern end of the west wall of the nave, but there is no south aisle, suggesting that the nave was rebuilt shortly before the Reformation. In any case, the building was thoroughly renewed in the 19th century, most of the window tracery dating from this time. The flushwork panelling on the heavily restored south porch suggests that this must have been a fine structure once. You step into a large, plain interior, with attractive brick flooring. The western end of the nave was screened in the 19th century to form a kind of baptistery, and the 14th century font has raised shields on its panels which were presumably once painted. Oddly, just beside the entrance into the nave is a doorbell, which raised the interesting possibility that you had to ring it to gain admittance, but which I think is actually there so that the organist can be informed when the bride has arrived for her wedding. You step through the western screen, and again the feeling is one of a quiet simplicity, overwhelmingly 19th century in character but with a number of interesting earlier survivals. An early 16th Century brass inscription asks us to Pray for the Soule of William Wood, and the contemporary delicate screen must have been a fine one judging by what has survived. The chancel arch above seems very high in proportion. Their little Mistress they Bemoan. A ledger stone in the nave makes a slightly more rustic stab at the lyrical art in asking us to remember Martha Turner, who died in 1696: if grace, vertue and truth could have preserved my youth, I had not gone soe soon to bed amongst the dead, but now I am at rest thankes be to God amongst the blest. Martha Turner here doe stay waiteing for Godes Judgement day. Unusually, the culprit of this doggerel has signed beneath: Martha Herne widow laid this stone soe large at her owne cost and charge. Immediately outside the south porch, a small plaque recalls the ten members USAF 564 Bomb Squadron whose plane crashed in Carr's Hill Wood on the 7th of March 1945.